This documentary challenges the widely held belief (the pre tribulation rapture theory) that in the end times, the rapture would happen before the tribulation, catch everyone off guard, and leave everyone else behind. [ie., Left Behind – movie seen by over 300 million] This isn’t what the Holy Bible teaches us, and After the Tribulation points that out. After the Tribulation references the King James bible, and takes no prisoners when it comes to simply pointing out the truth as documented in the Holy Bible. The reality of a cashless society isn’t far off, which will be an important facet of the implementation of the Mark of the Beast. 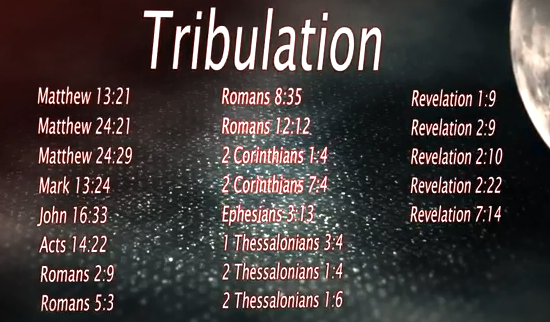 The Pre-Tribulation Rapture theory teaches that Christians won’t have to live through the tribulation. According to the After The Tribulation, the Pre Tribulation Rapture Theory is a relatively new concept with no record of it being taught prior to the 1830’s. John Nelson Darby is credited with bringing forth the idea of a pretribulation rapture via the Scofield Edition of the Holy Bible. The Scofield is used to train pastors. The definition of the biblical term “Elect” is also discussed, defined, and shown not to be only directed at Jews and Israel. 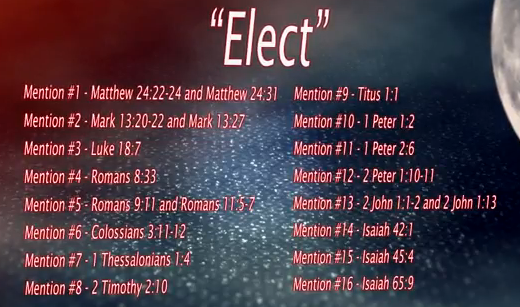 Bible References of the word Elect, often thought to be code for “Jews”. God’s Wrath, and the Tribulation, are often thought to be one in the same by many Christians, but they are shown to be different in this well documented documentary. Satan has not been to hell yet. He was cast into the earth when kicked out of heaven, not hell. The Anti-Christ who will head The New World Order‘s government is also described, and shown not to be Satan, yet powered by Satan. He will claim to be Christ and people from all religions will accept him as their Messiah. Afterwards, the Mark of the Beast will come on the scene with will be either “in” your head, or “in” your hand. See more in the documentary!